A convicted felon is back behind bars after Franklin Police caught him on the street with a gun. 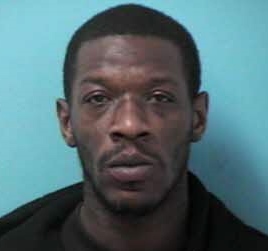 Flex Officers were on the lookout for 35-year-old Adrikias Baugh, of Franklin, after receiving information that he may be planning a shooting. At 3:20 yesterday afternoon, Flex Officers spotted Baugh on foot in the 600 block of Cherokee Place. When they approached, Baugh pulled a handgun from his pocket and put it into a vehicle through an open car window. Officers quickly took Baugh into custody and retrieved the loaded gun. Baugh, already wanted for a probation violation out of Maury County, remains in custody at the Williamson County Jail. He is a convicted felon with a lengthy and violent criminal history. Baugh will answer to the charge of Felon in Possession of a Weapon before a Williamson County Judge on 03/24/2015 at 9:00 am. Looks like one-bad-dude. Thanks FPD!